Skylar Brandt was born in Purchase, New York and began her training at the age of six with teachers Diana White and Christian Claessens at Scarsdale Ballet Studio. She also studied with Susan Jaffe, Valentina Kozlova, and Fabrice Herrault. She attended the Jacqueline Kennedy Onassis School at American Ballet Theatre from 2005-2009, under the direction of Franco DeVita. Brandt was a silver medalist at Youth America Grand Prix in 2004 and 2008. She performed as Swanilda in Coppélia in the Guggenheim Museum’s tribute to Frederic Franklin. Brandt was invited to dance at the Juilliard School’s Antony Tudor Centennial Celebration. 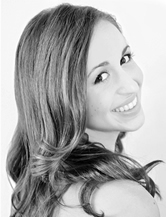 In 2007, she choreographed and performed in Capezio’s DVD for its national campaign. In 2009, Brandt joined ABT II. With the company, she toured throughout the United States and Europe, performing Medora from Le Corsaire, Aurora from The Sleeping Beauty, Jerome Robbins’ Interplay, George Balanchine’s Allegro Brilliante, and leading roles in other original pieces by such renowned choreographers as Jessica Lang, Aszure Barton, Jodi Gates, and Edwaard Liang. Brandt has performed in numerous galas at New York’s Lincoln Center and City Center, including the “Stars of Today Meet the Stars of Tomorrow”. She has also performed in other galas in Japan and elsewhere in the United States. She is profiled in an ABT II feature on the web series Dance Media 212. At the early age of seventeen, Brandt was invited to join the American Ballet Theatre, and has extensively performed its repertoire at the Metropolitan Opera House and the Brooklyn Academy of Music. In addition, she performed in the Royal Ballet’s production of Cinderella at Lincoln Center. Brandt was also nominated for the Princess Grace Award.